In addition to the earlier-covered HP Envy Spectre XT Ultrabook, HP has also re-jigged its mainstream notebook range with new updates to the Pavilion range. Top of the lot is the 1.5.6-inch HP Pavilion m6 that is almost an Ultrabook – we're guessing it loses out from conforming with Intel's Ultrabook spec by virtue of the fact it has a standard hard drive rather than an SSD. As you'd expect, it features Beats Audio and can come with beefed-up discrete graphics should you choose that option. Eight hours of battery life is promised. The model will feature "the latest AMD and Intel processors" under a brushed aluminium shell. HP says it reflects a refresh of the company's notebook design philosophy called Mosaic which, the company says "includes rich colours, premium materials and purposeful shapes". Up against the new Envy models, the m6 doesn't look a whole lot different – meaning you get a really thin and powerful notebook for a perfectly reasonable outlay. 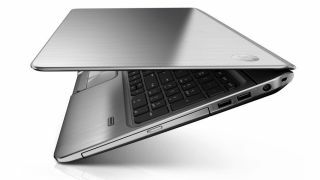 The HP Pavilion m6 release date is June with a starting price of € 649. In the US, HP has also refreshed other Pavilion models including a tapered chassis with new metal finish for the Pavilion dv6 and dv7, while the HP Pavilion dv4 is available in black liquorice, linen white and carmine red. All are also available with Nvidia discrete graphics as an option. The also-refreshed Pavilion g6 and g7 feature curved, beveled edges with a textured touchpad. The new models are available in ruby red, linen white, sparkling black and winter blue. HP Pavilion dv4, dv6 and dv7 US release date is June 20 with starting prices of $549.99, $549.99 and $799.99, respectively. HP Pavilion g6 and g7 US release date is July 25 with starting prices of $449.99 and $499.99, respectively.